It feels absurd to write that title near the end of November and just after friends and family in America celebrated Thanksgiving. But there is a grain of truth of in it as the eggplant field still remains at the farm, home to the summer vegetable of Japan. Since arriving in Japan in the 8th century, it's made itself right at home. The exact road it traveled I don't know, but this is a country that loves it with a fervent passion. The first eggplant of the summer is met with a joy that merits a holiday of its own, and the last of this deep-hued favorite is similarly mourned. Even though it is not my favorite vegetable and summer is nowhere near my favorite season, I well understand the sadness that comes with the end of the season. I am sorry to see one of the grandest of our fields and crops come to a close. The low slant of light this time of year always engenders a certain nostalgic feeling in me, not in the least I'm sure, because it makes everything around me look particularly beautiful. Every sight takes my breath away as the light perfectly highlights deep red leaves, brilliant orange kaki, the rich green leaves of the broccoli and cabbage as they ponder producing their fruits, and the dazzling blue sky arching over it all. Hurried as I might be on any given day, my steps slow inevitably slow each time I walk through the farm gate to drop off compost or begin whatever task is set for the day. The eggplant field, beaten up by another unusually hot summer and one of the strongest typhoons to hit the city in years, is scheduled for destruction next week. We've not harvested for sale for at least two weeks, and unusually large fruit now hang from some of the vines while others burst open to spill their seeds in a last shout of glory. Spiders string their webs everywhere to catch the last of the butterflies and dragonflies still moving about these days. The elaborate latticework of poles and bands and string will be removed. Branches will be cut and trunks pulled. The plastic mulch taken up and all this will be composted, pitched, or stored until the next seedlings arrive in the spring. It seemed only appropriate then to try my hand at a new pickle recipe. I have a limited supply of canning jars here, so this is actually a big decision. (Anyone who cares to send along a box or two of half-pint or smaller jars should leave a comment for my address. I promise to send a sampling of the proceeds.) I found the recipe while searching for something to do with a bounty of red peppers (another summer vegetable that recently closed up shop for the season), and thought it might be interesting. I'm worried about the slime factor, but it could be good. If life isn't about trying something you think might be weird, then it is about nothing at all. 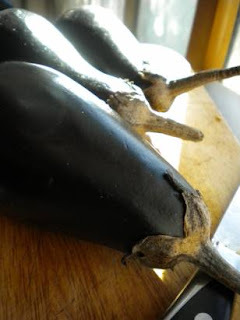 Bring the water to a goodly boil while quickly peeling and topping the eggplants. Cut them into strips about 3 inches long (7.5 cm) and 3/4 inch (2 cm) wide. Plop them into the bubbling water immediately and gently boil them for about 10 minutes. Every couple minutes press them down into the boiling water to make sure they cook thoroughly. When the pieces are sufficiently tender, drain them and rinse thoroughly with cold water to stop the cooking process. (You are, in effect, blanching the eggplant.) Let them loiter for a moment in the strainer while prepping the jars, lids, and canner. Peel and prep the cloves of garlic so they are at the ready when it's jarring time. Stir together the vinegars, sugar, oregano and salt and bring it to a boil over a medium-high heat. Plop in that eggplant and bring it to a boil once again. Then, remove from heat. Place one clove of garlic into the jar, pack in the hot eggplant pieces, and ladle that steaming brine over the top. Leave a 1/2 inch (1cm) headspace and remove air bubbles. Once that's done, check the headspace again and add more hot brine if necessary. Wipe the rim, put the lid and screw band on, and repeat! Process jars for 15 minutes in a boil water bath canner. I peeled and topped as quick as I could, but this process, while not as slow as those darn chestnuts, is not fast. The eggplant begins to brown rather quickly, so popping it in the water stops that process while starting another. I ended up doing two batches, so a few pieces turned an unsightly shade while I waited. I'll use them in something else, but yet again, canning shows what a great group process it can be. My advice would be to have at least one more pair of hands working away to get the eggplant ready. I used cider vinegar instead of white vinegar as that is what is available in my local grocery store. Speaking of the brine, I recommend tripling the amounts listed here. I ended up with only three pints in the end with lots of eggplant bits left over. Operator error may be the culprit here (it wouldn't be the first time) and I may try again. I would be grateful to hear word from anyone else who gives this a go. Please be aware that these are not attractive pickles. My husband just asked if they were octopus, which ought to be telling. Joan your fearless attitude is inspiring... I made myself and all those around me thoroughly sick of eggplant this summer, serving it in practically every meal. All because I was too chicken to can it somehow. Let us know how they turned out! Were they fat oval eggplants or the long slender ones? Your last two sentences: priceless. Anonymous, they were long slenderish ones - gone fat now with the end of the season. I'll try to tweet a photo of them today. My husband reports they are delicious served over rice, just not attractive. I've not tried them yet, but today could be the day. Jackie, Many thanks! It was one of those hilarious yet mildly disheartening moments as I realized how completely accurate his statement was. These sound fantastic! Unfortunately our new bundle of joy HATES it if I eat anything with garlic in it, so all of the pickling (garlic scapes and green tomatoes) I did this year will be gifted to others. Sigh. Joan, I just added this to my Patchwork Living Blogging Bee as a means to keep track of the recipe. It appears that eggplant is one veggie that does well here, so I need to figure out how best to use it. Kris, that's great! They are definitely not attractive, but they are yummy. Rave reviews from all so far, except I've not heard a peep yet from two friends. Anonymous, yeah!! I'm so happy you liked them. I think they might be good, too, in nori rolls. Just an idea.